Born: 1 July 1867, Swellendam, South Africa. Died: 13 July 1952, Stellenbosch, South Africa. Berthault de St J. van der Riet spent his boyhood in Simonstown where his father, Frederick J.P. van der Riet, was a magistrate. He received his early education at home from his elder sisters. In 1876 he started his formal education at the Stellenbosch Gymnasium - a forerunner of Stellenbosch College (1881), later renamed Victoria College (1887). He passed the matriculation examination of the University of the Cape of Good Hope with honours in 1885. Continuing his studies at the Stellenbosch College he was awarded the degree Bachelor of Arts (BA) in Mathematics and Natural Science, with honours, by the University of the Cape of Good Hope in 1888. Meanwhile he had assisted Professor Albrecht Fischer* of the college's Agricultural School in teaching geology during 1887-1888. The next year he continued his studies in chemistry at the South African College, Cape Town, under Professor P.D. Hahn*. He was awarded the degree Master of Arts (MA) in Natural Science (Chemistry) by the university in 1890, after passing eight written examination papers and a two day practical examination. He was only the second student to receive masters degree in natural science in southern Africa, after Charles F. Juritz* in 1886. Funded by a scholarship Van der Riet went to Halle, Germany, where he obtained the degree Doctor of Philosophy (PhD) in chemistry, with distinction. His thesis was entitled Zur Kenntniss der Dichlorbernsteins�uren und ihrer Derivate (1893, 33p). The next year he published a paper based on his research in Justus Liebig's Annalen der Chemie. His studies included geology and mineralogy and for some time he also studied petrography at the University of Heidelberg. Upon his return to South Africa in 1894 he was appointed as an analyst in the Government Analytical Laboratory, under the senior analyst, C.F. Juritz*. In July the next year he returned to Stellenbosch to teach chemistry and geology at Victoria College. When creating a division of geology he acquired a polarising microscope, a reflection goniometer, hundreds of samples of rocks and minerals, and a set of wooden crystallographic models. In August 1897 he was promoted to professor of chemistry and geology. That year he married Florence L. Beamish, with whom he had six surviving children, three sons and three daughters. Van der Riet's geology teaching was taken over by Robert Broom* in October 1903. His appointment was changed to professor of chemistry and metallurgy (to 1907) and then to professor of chemistry. Until his retirement at the end of 1940 (aged 73) he devoted most of his time to teaching and the development of the Department of Chemistry, leaving little time for research. However, he had a life-long interest in the essential oils of indigenous plants and spent his free time studying their chemical and physical properties, an activity that caused his students to call him "Phenol" behind his back. A paper by him on "The chemical composition of berry wax" was published in the Transactions of the Philosophical Society of South Africa (1906, Vol. 16, pp. 443-445). Van der Riet became a member of the South African Philosophical Society in 1896. He remained a member when it became the Royal Society of South Africa in 1908, was elected a Fellow of that society in 1912, and served on its council for many years. He was an early member of the South African Association for the Advancement of Science (founded in 1902), serving as president of its Section B (which included chemistry) in 1912 and as a member of council for some time thereafter. At the association's annual congress in 1910 he read a paper on "Acetylene as a heating agent in chemical laboratories", an abstract of which was published in the association's Report for that year. At the 1914 congress he contributed a paper on "Chemical analysis of the mineral phrenite" (Report, 1914, pp. 300-301; this mineral, a silicate of calcium and aluminium, was discovered by, and named after Colonel Hendrik Prehn*). In 1906 he was elected as the first president of the Cape Chemical Society, serving as president again in 1911/1912 and as vice-president for the next year. He was also a member of the South African Chemical Institute, served on its council from 1930, as vice-president for 1932/3, and as president for 1933/4. 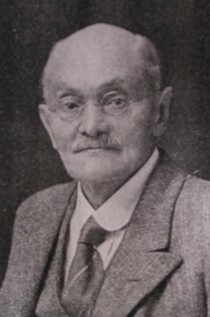 For many years Van der Riet served the University of the Cape of Good Hope as an examiner in various subjects: Physical geography for the BA degree (1896/7), mineralogy and petrography for the first mining examination (1896/7), and various branches of chemistry for the BA and MA degrees (1902-1917). Cape of Good Hope. Report of the senior analyst, 1894, 1895. Obituary: Berthault de St Jean van der Riet, 1867-1952. South African Journal of Science, 1952, Vol. 49, p. 187. Obituary: Berthault de St Jean van der Riet. Transactions of the Royal Society of South Africa, 1955, Vol. 34, pp. xviii-xix. Royal Society of London. Catalogue of scientific papers] [1800-1900]. London: Royal Society, 1867-1925. South African Association for the Advancement of Science. Report, 1903, 1905/6, 1910, 1912, 1913, 1914, 1918. South African Chemical Institute. Proceedings and list of members, 1933-34, pp. 39-45. South African Journal of Science, 1926, Vol. 23: Officers [of the SA Association for the Advancement of Science]. South African Philosophical Society. Transactions, 1897-1907, Vol. 9, 10, 16 and 17. Thom, H.B. et al. Stellenbosch 1866-1966: Honderd jaar ho�r onderwys. Kaapstad: Nasionale Boekhandel, 1966. University of the Cape of Good Hope. Calendar, 1889/90, 1890/1, 1895/6-1917/8.